Specter’s Series 9000 is designed and manufactured to meet the highest quality standards. 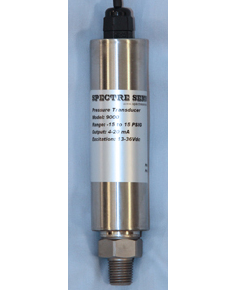 Each transducer’s output is digitally mapped to correct for any non-linearity or inaccuracies in the sensing element. This digital correction provides the most accurate and flexible pressure transducer in the industry. Outputs: 4-20mA, 0-5Vdc, 0-10Vdc. Optional 4-wire, isolated outputs and RS232 / RS485 available.